While visiting with my brother and his family in the desert near Cave Creek, Arizona for a couple of weeks Charlize and I reveled in sun, warm temperatures and one “gully washer” consisting of heavy rain and hail. Then we made the now easy drive to Carlsbad, California for a visit with my son and his family. 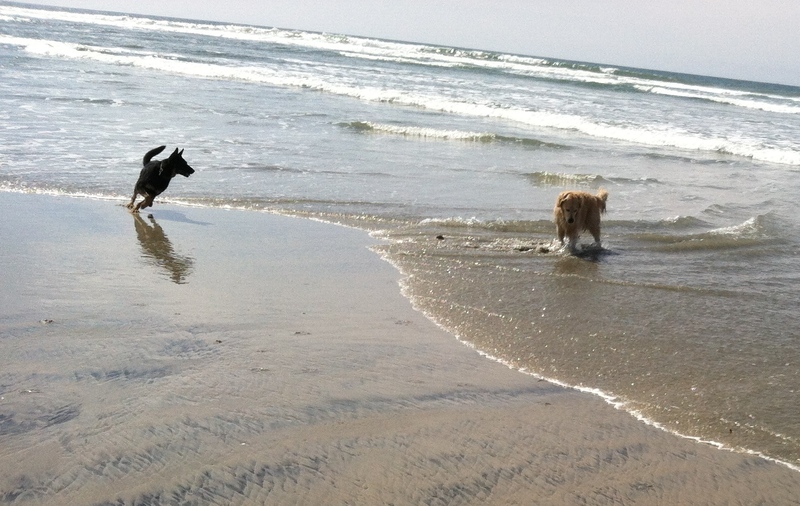 More sun and warm temperatures and Charlize and her pal Bentley were given the opportunity to play in the surf at the dog beach of Delmar. The subdivision where my son’s house is located is full of homes with owners who care about and spend time and/or money on their front yards. 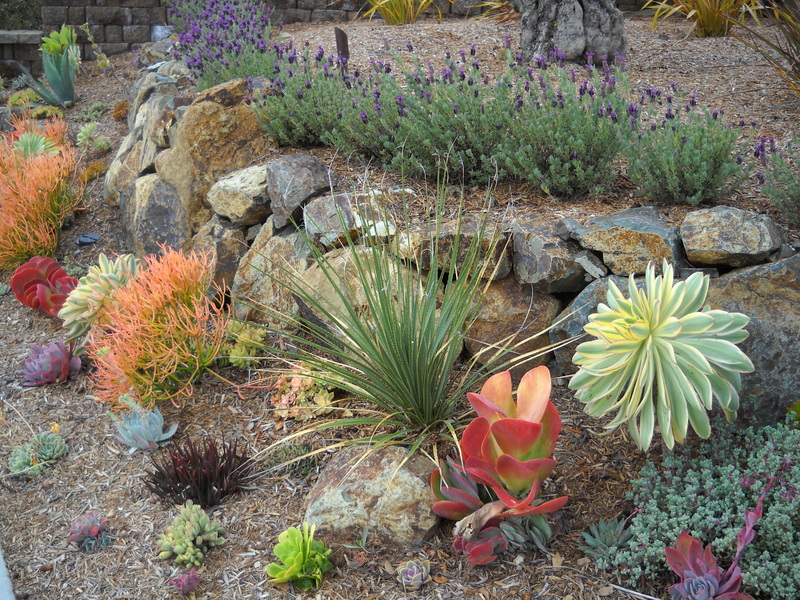 While walking Charlize one morning I snapped this photo of a succulent garden next to the sidewalk. It mimics a choral reef doesn’t it? Enough to make a man and his dog smile. After a short week visiting with my granddaughters and their parents Charlize and I, gone from home for almost a month, were ready to get back on the road. I planned ahead, delaying our departure until late enough in the morning to hit the LA traffic between ten and eleven in the morning. My logical reasoning was that timing our trip in this manner would allow us to hit the LA traffic at a less crowded time. Wrong! We were stymied by heavy traffic, moving at an average of about ten miles per hour until the five lanes of freeway eventually became a parking lot. Almost an hour later we finally cleared the accident. The site was crowded with two fire trucks, two police cruisers and three wrecked automobiles occupying three lanes. We made it to Paso Robles early enough to spot a Charlize-friendly La Quinta and check in. That evening the hotel hosted a free wine and cheese tasting with some outstanding Zinfandels that the area full of wineries is known for. Nice! 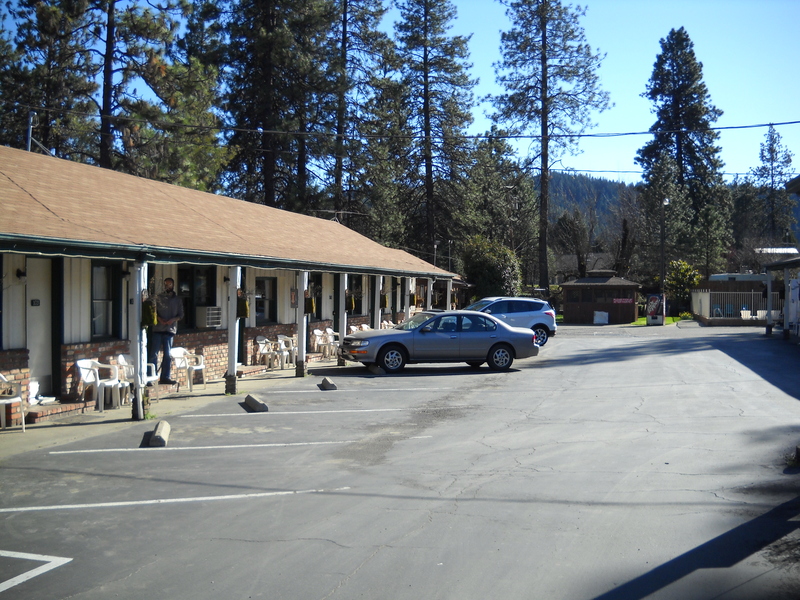 At the end of the next day we stopped at another of those 50’s motels this one in Trinity, California. 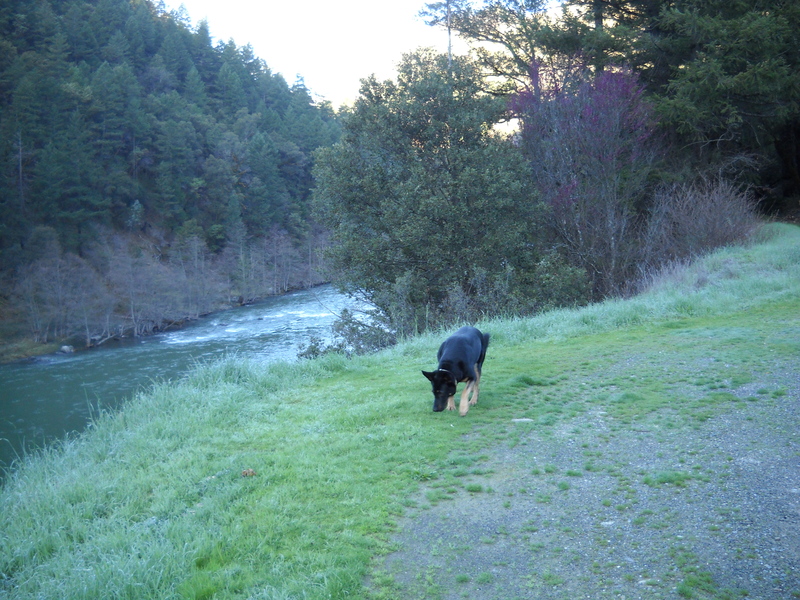 A beautiful place close to Trinity Lake and on the Trinity River, an area made famous by the gold rush. The next day we were off early after a stop at a local coffee shop next door to the motel, the real reason that motel was chosen. Their doughnuts and sweet rolls were all made on site, fresh, warm and too delicious for my waistline. The coffee was good too. 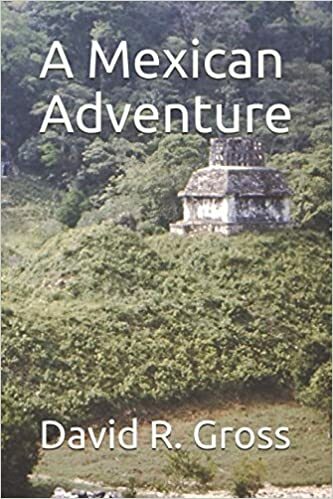 We left the town shrouded in mist and worked our way to the top of the pass where Charlize discovered fascinating scents that occupied her attention until I finally lost patience. That’s the Trinity River flowing through the memorable landscape. We worked our way back to the 101 and the Oregon coast, stopping often to just absorb the endlessly changing scenes of rocks, water, mist, waves, wildlife, and peace. Good for the soul. We stopped that afternoon in the little town of Yachats, Oregon north of Coos Bay and south of Newport. There are an amazing number of beach homes between the highway and the sea and numerous small towns to serve the transitory occupants. It is amazingly beautiful but I’m not convinced I would enjoy living that close to neighbors. I didn’t bother to inquire about the cost of that real estate. 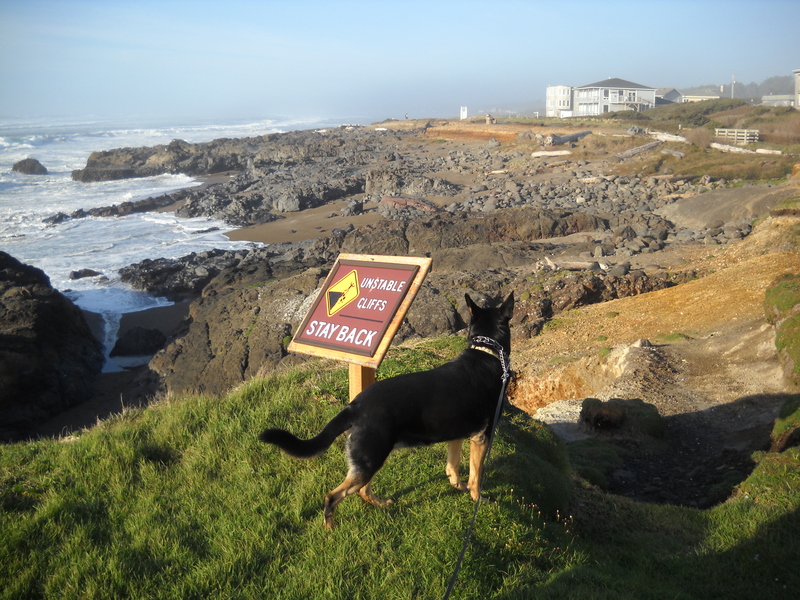 The hotel/resort we found in Yachats was right on the cliff next to the ocean, very nice, welcomed Charlize and wasn’t that much more expensive than the motel in Trinity. It was a bargain and even had a good restaurant. My room faced the ocean with a great view and Charlize and I were able to take a long walk along the cliffs that evening. The sign reads; “unstable cliffs, stay back”. Charlize only weighs seventy-five pounds and was quite interested it whatever was happening over the edge. I stayed well away. The next morning we continued north along the coast where we encountered more breathtaking scenery but, again, many small towns. Once clear of the towns we frequently encountered people driving thirty miles per hour in fifty-five mile per hour zones, taking in the views. We had been gone from home for nearly five weeks and I was getting anxious to sleep in my own bed. North of Lincoln City I spotted state highway 18 angling north and east to Portland. We drove through some interesting rolling hills and farm country, through some Portland suburbs and hooked up with I-5. The traffic was heavy, requiring hard concentration. I’m not a fan of freeway driving, much preferring the back roads, but I pulled into my driveway before four that afternoon. Home again and glad to have arrived safely! After eating overpriced Mexican food, fancy presentation, ordinary taste, in Sedona Charlize and I braved the traffic to Cottonwood. The old road is now a divided highway. The last time I was in this part of the world there were no divided highways and Cottonwood was a small village, twenty-odd miles from Sedona on a twisting two-lane road. Another CSU veterinary school graduate, who graduated two or three years behind me, established a practice in Cottonwood in the mid-1960’s. He barely made a living for several years. I lost track of him after leaving Phoenix but if he stuck it out it appears plenty of population moved in for him to make a go of it. The whole valley, from Camp Verde to Cottonwood to Clarkdale, is now full of houses, strip malls, big box stores and hobby ranches on both sides of highway 260. 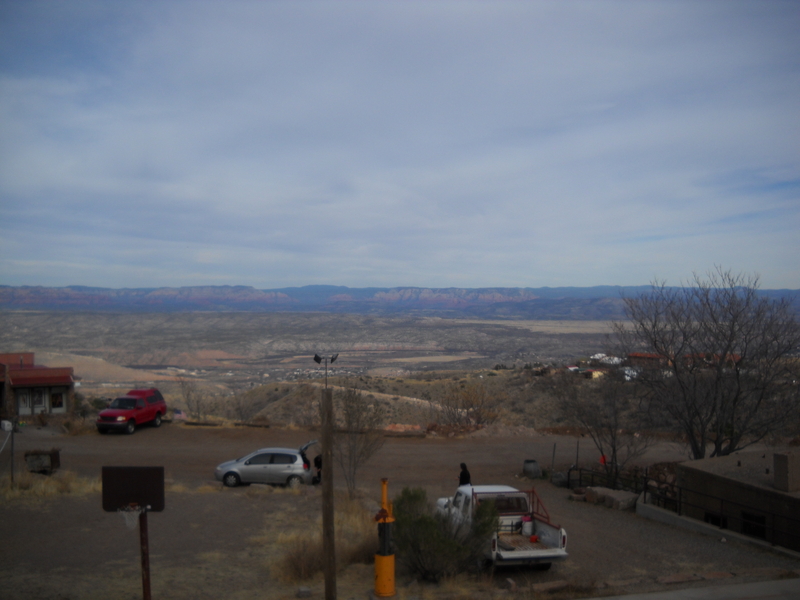 Here is a view from Jerome, on Cleopatra Hill, looking down into the valley. The cluster of buildings in the left center is Clarkdale. The distant mountains are home to a portion of the Prescott National Forest, the Tuzigoot National Monument, Dead Horse Ranch State Park and the Camp Verde Indian Reservation. 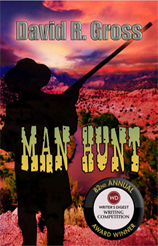 It is only forty-three miles from Clarkdale to Prescott and another fourteen from Prescott to Granite Basin where in the summers of 1950 through 1952 my Dad and I built a cabin in the shadow of Granite Mountain. My brother Joe, three and a half years younger, worked with us but he claims his only job was to straighten bent nails. I seem to remember him doing a lot more, but he is expert at straightening bent nails. We built the cabin on U.S. Forest land with what was supposed to be a ninety-nine year lease. Along the way a lot of rules got changed. After Dad retired he and Mom lived in the cabin except in the winter when they traveled to Guyamas, Mexico where they parked their travel trailer near the breach. 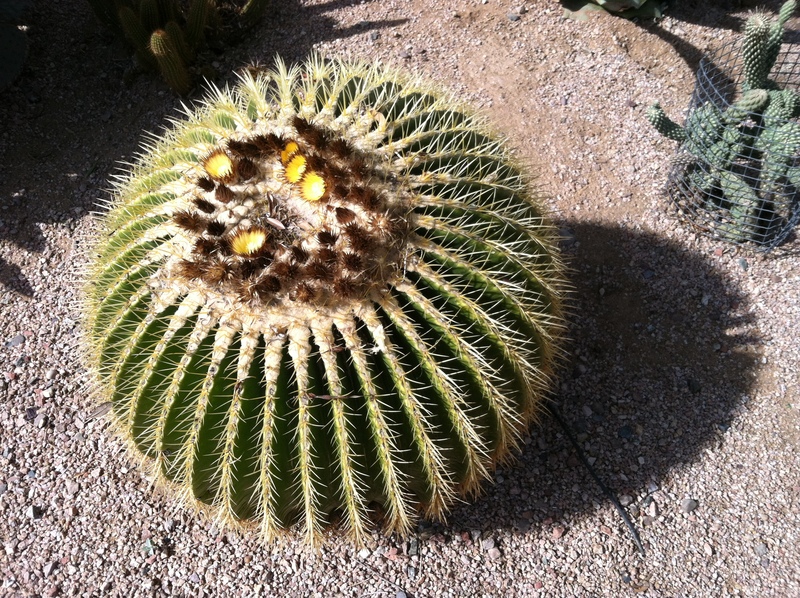 After Dad died it fell to Joe, living in Cave Creek north of Phoenix, to use and maintain the cabin. It became more and more of a chore as the years past. 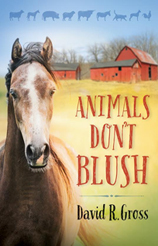 In the last few years every time he and his wife went to the cabin they both had to work at repairing, maintaining, cleaning and cutting away brush for a fire break. They worked so hard they usually returned to Phoenix ill. Along with all the labor necessary, and insisted upon by the Forest Service, the place was costing thousands of dollars each year. The ground rental increased from thirty-five dollars a year in the 1950’s to over two thousand, plus taxes, association dues to maintain the water system and roads, property insurance and the cost of repairs and maintenance. Joe was finally able to sell the place recently. 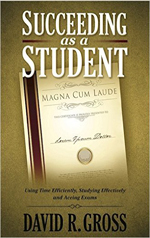 It is now a place of fond memory rather than a constant financial drain and worry. I have not been back to the cabin since we scattered Mom’s ashes there in 2001. I decided to rely on my memory of the good times rather than revisiting the place. I have it well pictured in my mind, along with a few old snapshots tucked away someplace. I need to find those photos. Whitey took us up the steep road to Jerome. Back in the day the family sometimes drove from the cabin, through Prescott Valley to Jerome. Then it was a true mining ghost town, full of abandoned houses and buildings just made for kids to explore and create our own stories and imagined legends. When Charlize and I arrived this time we found the place full of tourists taking photos of other tourists with their digital cameras. So Charlize and I joined them. Many if not all of the buildings and houses have been resurrected. 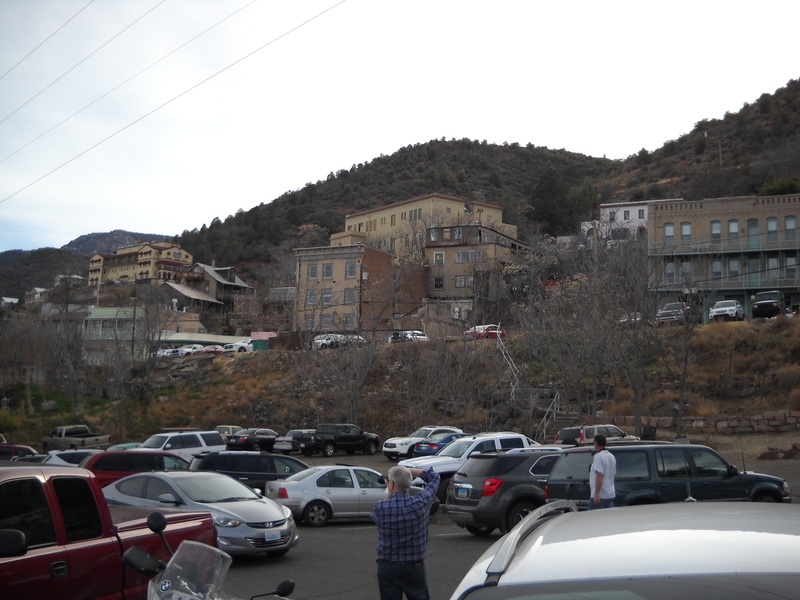 People have returned to live in Jerome, living off the tourist trade, I presume. All the shops indicate thriving tourism, but that’s yet another subject I know little to nothing about. We didn’t tarry in Jerome and less than two hours later we were in Cave Creek at my brother’s house in the desert north of Phoenix. My runny nose and allergy-clogged head remind me of the almost forgotten reasons leaving the Valley of the Sun was not difficult. 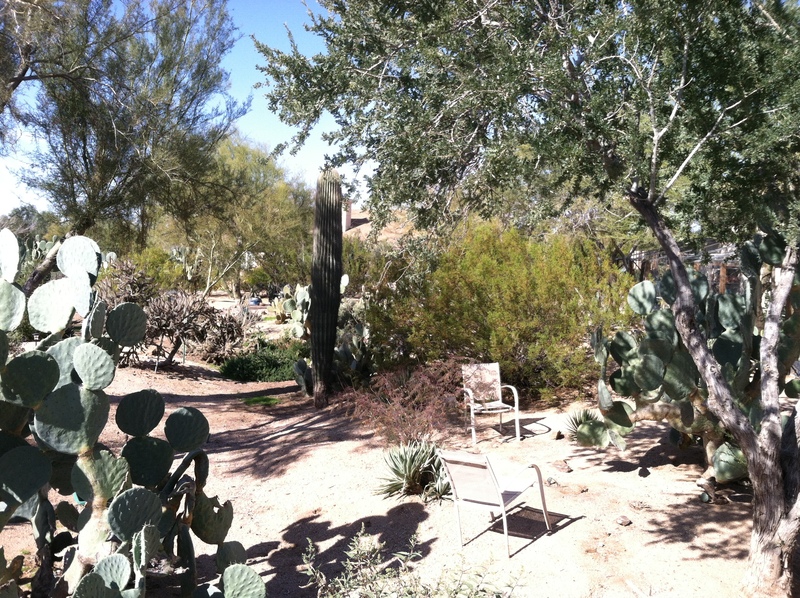 This photo of the Sonoran Desert in February, as represented by Joe’s back yard, doesn’t seem to provide any reason for allergy problems but a close look shows the cacti blooming. It was after dark when we finally arrived in Las Vegas. We enter town on a freeway I know nothing about, five or six lanes of rush hour traffic at 65 miles per hour. I have the mistaken idea that I can spot a hotel or there will be a sign for one. I will be able to pull off and check in. I am quickly relieved of that ridiculous idea as the traffic worsens. I gradually inch our way to the right lane and take the first exit I come to. I obstruct traffic for seven or eight blocks looking for a place to pull off the street. I spot a parking lot and pull into it. Whitey, Charlize and I are all still whole, amazing! The hometown drivers continue to curse my out-of-state license plates and are, no doubt, glad to see me get the hell out of their way. This time my new GPS comes through. I am less than a mile and a half way from a pet friendly La Quinta Inn. I follow the spoken directions and the map to the front door. I thank the device. I don’t know how I would have coped without it as tired and frazzled as I am. I know for certain I am getting “long in the tooth” (that’s how one gestimates the age of older horses). A long drive and two nights in 50’s motels with less than comfortable beds and my shoulders and back are aching. The spacious La Quinta room includes modern plumbing that functions as intended and a comfortable king-sized bed. I’m living large. The folks at the front desk recommend a close by restaurant. After a nice steak and a long hot shower I catch up with the Winter Olympics. Charlize wolfs down the steak scraps that I mix in with her kibble. The Las Vegas room cost less than either of the previous night’s motels. We are up early and on the road again by 7:30. 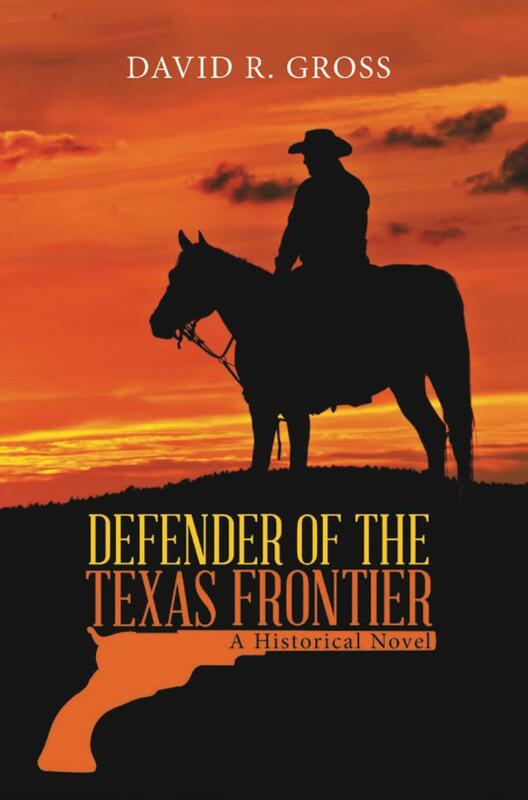 I am anxious to visit old, familiar places in Arizona. 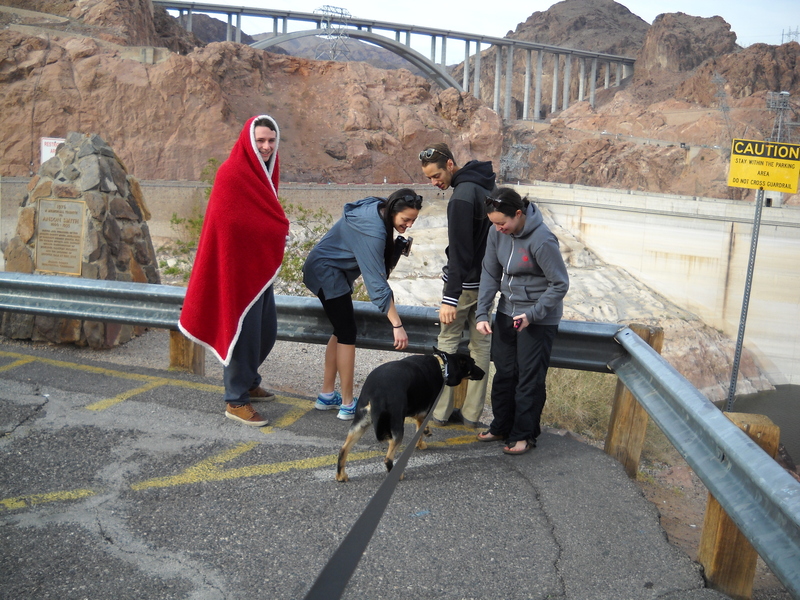 We arrive in Boulder City Nevada and follow the signs to Hoover Dam. 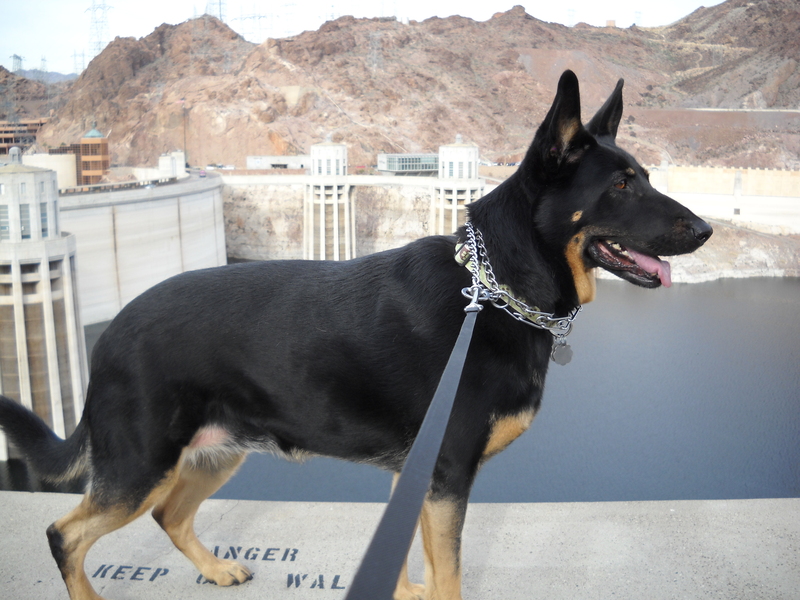 It will always be Boulder Dam to me. We stop to gawk, along with a surprising number of tourists. Lake Mead reflects the drought conditions of the southwest the water level significantly lower than I can remember. Charlize does her thing making friends with two young couples. I say hello and they answer, very friendly but speaking what I surmised to be a Balkan language. They have a few words of English but my zero words in their language make it impossible for me to find out what I am certain is an interesting story. 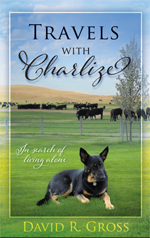 I do understand when they ask for the dog’s name but I just leave it at “Charlie” too difficult to explain more. Since Charlize doesn’t read she was unable to follow the directions stenciled onto the wall she jumped onto. Just above Charlize’s rump two lines are visible on the dam. The top line is the high water mark for Lake Mead. I can’t come close to guessing how much water is gone from this reservoir. Next on the agenda is Oak Creek Canyon and Sedona. The sun is out and the outside temperature gauge in Whitey reads seventy degrees, this is my Arizona in February. In the late 1940’s my family used to go camping in the Oak Creek Canyon. Sedona consisted of a gas station and a general store. There might have been a dozen or so rustic cabins sprinkled along the canyon. Progress and population evoke change. The canyon now seems full of Inns and restaurants and summer homes all crowding in on the remaining campgrounds. 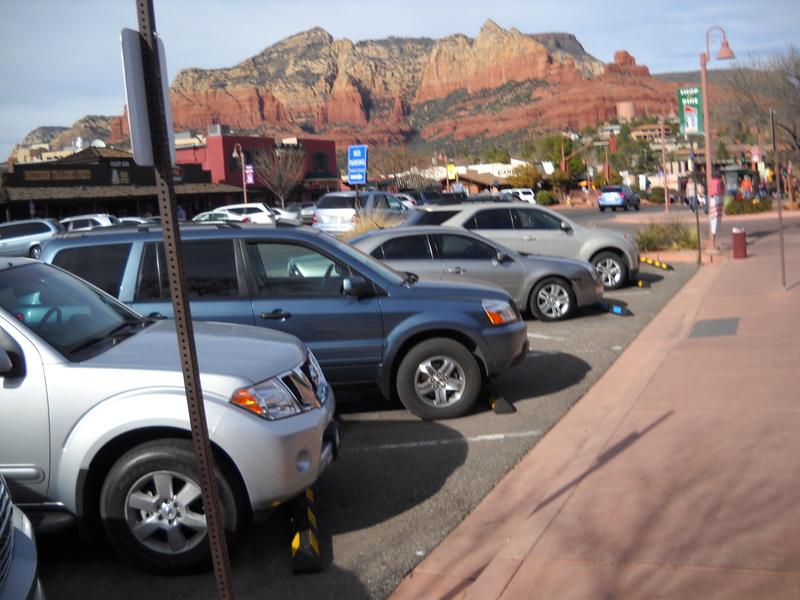 Sedona is a huge tourist mall, crowded with cars, RV’s and people. I take Charlize for a walk. One of the places we pass advertises: “The history of Oak Creek Canyon and Sedona”. We did not go in so I have no idea what they were selling, maybe just providing free information, but my impression of Sedona is that not much is given away free. There I go again, complaining about “progress”. But I urge you to imagine what Sedona looked like before this photo. Note the landscape, the red rock formations poking over the clutter.